In my previous post, Using LINQ to Twitter in Windows 8 Metro Apps, I cheated a little (some might say a lot) on my UI architecture by using code-behind. In this post, I’ll make it all better by showing you how to separate the model and interaction logic from the UI design – proper separation of concerns. I’ll accomplish this with a pattern, named Model-View-ViewModel (MVVM), which is widely used for WPF, Silverlight, and (soon) Windows 8 Metro Apps. I’ll start by discussing what MVVM is, move to how I’ll apply it to the previous Windows 8 Metro app, and finish with a step-by-step walkthrough to refactor from code-behind to MVVM. The subject of whether to use MVVM or not can be debated forever. However, it’s a useful way to achieve separation of concerns in your application and many people like and use it, including myself. Jeremy Likeness has a nice site that specializes in the subject: MVVM Explained. There are a handful of good frameworks for helping you write applications using MVVM. In this app, Since Windows 8 is so new, these frameworks aren’t generally available or ready. However, MVVM is a pattern, not a library, and you can always provide your own code to support the pattern, as you’ll see in this post. The three objects in the illustration above represent files for implementing a View, ViewModel, and Model. The view is MainPage.xaml, where you can see tweets and click the Refresh button. The model is an object that holds information for a single tweet. Actually, we’ll be working with a list of tweets, which will be held in the ViewModel and bound to the View. Model: Hold data for a single tweet. Technically, the list of tweets, held by the ViewModel is also a model component – instead of a single instance it’s a collection of instances. ViewModel: Hold a list of current tweets and provide a command handler that responds to Refresh button clicks and populates the list of tweets. View: Display tweets and let the user click a refresh button. In the previous post, I named the object bound to the View with a ViewModel suffix, TweetViewModel. 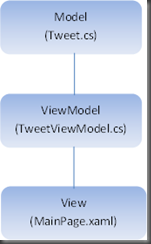 To fix this, select the TweetViewModel.cs file, in the Solution Explorer Project, press F2 and change the name to Tweet.cs. You’ll see a message box asking if you want to do a rename and you should click the Yes button, which renames the class name in the file as well as any declarations of that class in the project. Note: I’ve also done a refactoring of the namespace, LinqToTwitterPublicQuery, to RefactorToMVVM. Though this class was previously called a ViewModel, the name didn’t capture the essence of what a ViewModel is about: model access, binding, and state management. You’ll see some of this in the next section. The TwitterCommand constructor accepts an Action delegate, assigning handler to callback. 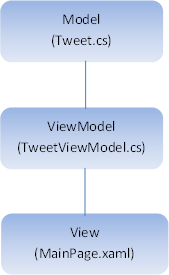 When the View triggers the RefreshCommand in PublicTweetViewModel, Execute is invoked, which then invokes the callback delegate that the PublicTweetViewModel constructor assigned to the OnRefresh method. After LINQ to Twitter gets new tweets, OnRefresh fires the PropertyChanged event, passing the property name, Tweets, that changed. This tells the View to re-bind to Tweets. With the ViewModel in place, all that’s left to do is hook up the ViewModel in the View and complete binding so the View doesn’t use code-behind anymore. Notice how the MainPage constructor sets its DataContext property to an instance of PublicTweetViewModel. I won’t put any more code in the code-behind. Note: I could have avoided putting any extra code in the code-behind by setting the DataContext in XAML. Unfortunately, the preview version of VS11 doesn’t support that yet. If you do, you’ll see a message like “Method 'add_PropertyChanged' in type 'RefactorToMVVM.PublicTweetViewModel' from assembly 'refactortomvvm.intermediate, Version=1.0.0.0, Culture=neutral, PublicKeyToken=null' does not have an implementation. C:\Users\jmayo\Documents\Visual Studio 11\Projects\RefactorToMVVM\RefactorToMVVM\MainPage.xaml RefactorToMVVM”. <Button Content="Refresh Public Tweets" Height="72" Width="365"
For RefreshButton, remove the Click event handler and replace it with the command binding shown above. This is how the RefreshCommand property in the PublicTweetViewModel, which is an instance of TwitterCommand binds to the button. Since we already deleted the RefreshButton_Click method from the code behind, we need to tell PublicTweetListBox to get it’s data by binding the Tweets collection, from PublicTweetViewModel, to the ItemsSource property. Within the DataTemplate for PublicTweetsListBox, each individual tweet binds the same as the previous post. The exception is that you must change the TextBlock binding for the previously named property, Tweet, to Text. If you recall, we changed the Tweet property of the model (also named Tweet) to Text. That’s it, press F5 to run the application. You’ll notice that it works exactly like the previous application where pressing the Refresh Public Tweets button will load public tweets to the screen. In this post, I attempted to redeem myself from the supposed crimes of those who would be offended. Seriously, the MVVM pattern is pretty slick in how it relies primarily on binding and keeps the UI design separate from the implementation. You saw an image of how the previous code would be refactored to support MVVM. Then I took you through a series of steps that refactored the Model, created a new ViewModel and an ICommand implementation. Finally, you learned how to connect the ViewModel to the View and bind the ICommand to the Button and data to a ListBox. The result is an application that works the same as its code-behind predecessor, yet is more maintainable because of the clean separation of concerns that MVVM helps with.